Earthquakes inhabit the Mexican psyche. Their presence is testified to by absences, the gaps in the urban environment that, in her essay Sidewalks, Valeria Luiselli calls relingos. But they are also present in the daily routines of Mexican people: keys hung next to the door to facilitate a speedy exit, nightwear that can be worn in the street when that exit has been successfully completed, the knowledge that brigades must be formed and people rescued from collapsed buildings before anything else is done. Regular earthquake drills are carried out so that everyone, including the youngest schoolchildren, knows where they should be and what they should be doing when the alarm sounds. You can fix a person’s age by their stories of the 1985 earthquake that devastated Mexico City: one of my grandchildren was trapped in the rubble; I was driving on the periférico; my mother left us with a neighbor to join the brigades; my father helped to… There is even a novel—Leonardo Teja’s Esta noche el Gran Terremoto—in which the Earthquake appears as a larger than life character no one has ever seen, but whose arrival is anxiously expected at any moment. But earthquakes don’t only happen in Mexico City. On September 7, 2017, a seismic event was registered off the southern Pacific coast of Mexico and on September 19, the thirty-second anniversary of the 1985 quake, the alarms sounded through a much wider area of the country. When the aftershocks had finally died down and the loss of life and damage to buildings had been assessed, it was clear that a broad swathe of southern Mexico would be in need of reconstruction: both physically and psychologically. Far from the attention of the international media, Oaxaca State suffered some of the most serious damage, much of it in isolated rural areas. 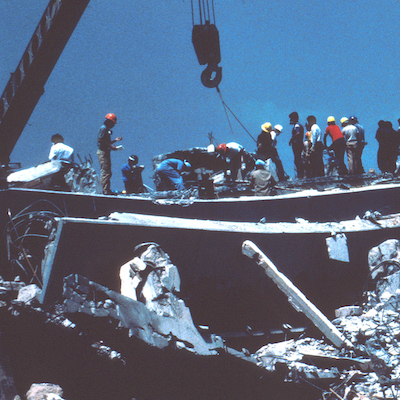 In the indigenous community of Juchitán de Zaragoza, for example, thirty-six people died in the first quakes that September (at that point over half the total deaths for the whole country; the final toll by the end of September was more than five hundred) and buildings were reduced to rubble. In response to this devastation, a number of community organizations came together under the name of Tejamos Oaxaca (Weaving Oaxaca—the state is famous for its magnificent traditional textiles) to work with the four most seriously affected communities with the aim of reconstructing social bonds and creating spaces for “thinking, analysis, learning, entertainment and celebration.” By September 2018, the project had collected 533,000 pesos ($27,500) and had carried out projects that include: the restoration of Spaces for Child Recreation in Juchitán; workshops in which schoolchildren were encouraged to express their experiences in the form of chronicles; and another series of workshops in Tradition Embroidery, aimed at reactivating economic activity and professionalizing the work of the region’s embroiderers. In addition to these activities, Diego Fonseca, editor of the Oaxaca publishing house Almadía, gathered together thirty-five writers from a variety of genres to chronicle their personal experiences of or reactions to the disaster. Texts were donated by such authors as: Carlos Manuel Álvarez, Lydia Cacho, Alejandro Zambra, Cristina Rivera Garza, Juan Villoro, David Miklos, Brenda Lozano, and Verónica Gerber Bicecci. The text that I finally chose to translate for this issue, “Bodies” by the poet and journalist Sara Uribe, brings together many of these themes and expands them to consider our social relationships, social spaces, and distances. In this essay, the body is not only a voluntary or involuntary point of contact with the other, but is the focus of socio-political forces, the body on which patriarchal attitudes continue to act, even in the face of those “devastating tragedies.” Uribe raises the question of what will happen to that body when the dust has died down and the final corpse has been removed from a collapsed building. Will that body, the body social, the body politic, have learned anything from the experience? Further information about Tejamos Oaxaca can be found in Spanish and English here.